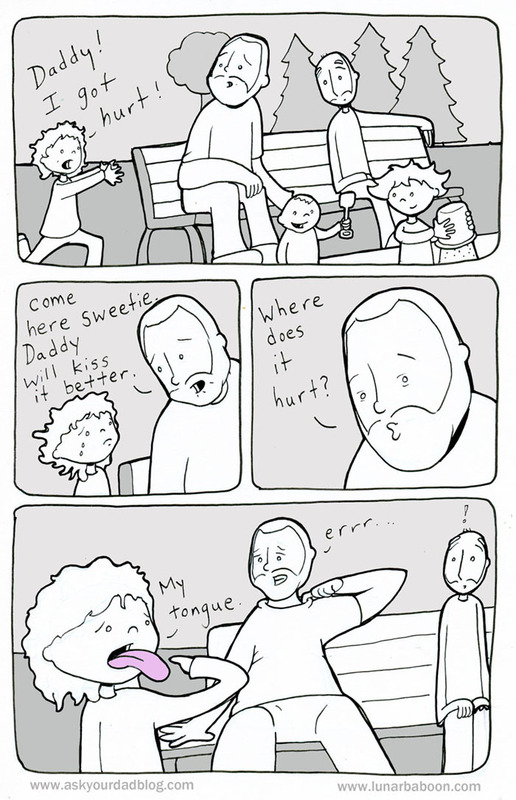 Chris at Lunarbaboon is one of my favorite artists on the web. His comics are funny, heartfelt, and sometimes irreverent. They bring a smile to my face every time they appear in my news feed. I'm honored that he took the time to draw Duchess and I for an exclusive comic just for Ask Your Dad! If you would like to see more of his work, you can find him on Facebook, Twitter, or on his site, www.lunarbaboon.com. Tell him I sent you! Thanks again Chris! Currently incubating my first "kiss my boo-boo" sayer, but what immediately popped into my head is that this is one of those times where you kiss your finger and touch your finger to the boo-boo. Please God, let that be something that works for me later on and doesn't bite me in the rear. Something similar happened to my grandfather when my sister fell down. The difference is that it was her bottom.